The parents of three schoolgirls from London who fled Britain to join the so-called Islamic State in Syria have demanded an apology from the Metropolitan Police for miscommunication and false claims. 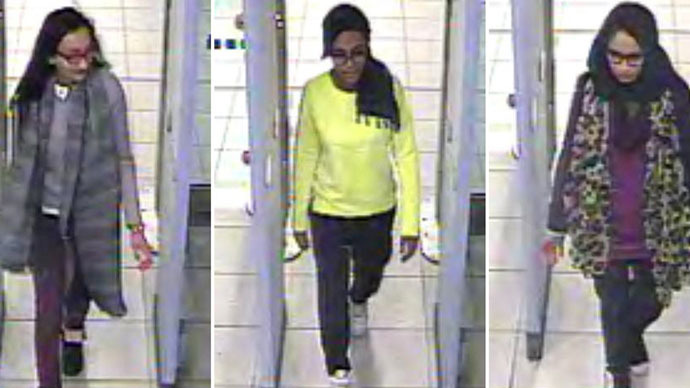 The three girls Shamima Begum and Amira Abase, both 15, and Kadiza Sultana, 16, left the UK on February 17 to fly to Istanbul. They are believed to have entered Syria within days, allegedly to join the Islamic State (IS, formerly ISIS/ISIL). The families have now called on Metropolitan Police Commissioner Sir Bernard Hogan-Howe to apologize, after Scotland Yard issued a misleading statement that police retracted hours later. The Met wrongly said the families knew a 15-year-old friend of the girls, all pupils at Bethnal Green Academy, had traveled to Syria weeks before the three disappeared. The families insist they were unaware, claiming they may have been able to stop the girls had they known. On Saturday, the Met issued a statement apparently rejecting the families’ claim. The Met said the families had been told in December 2014 by the deputy headteacher of Bethnal Green Academy. Hours later, the Met retracted the statement. In reality, police had written to the parents asking for formal statements, as their daughters had been friends with the girl who left for Syria. But instead of handing those letters directly to the families, they were given to the girls themselves, who hid them in school textbooks in their bedrooms. The families only found the letters after their girls went missing. Tasnime Akunjee, solicitor for the families, said: “I would encourage the commissioner [Hogan-Howe] in his upcoming select committee appearance on Tuesday to do the right thing by these distraught parents and say sorry. It is a disgrace that the Met in their original press release effectively accused their families of being liars. “The families have expressed that the deepest source of upset in this affair has been the failure by the police to inform them of the fact that the first girl to go missing had gone to Syria, a fact that was only known to them after their own children had also gone missing. The girls are believed to be in a house in Raqqa, an IS stronghold, together with a British girl who helped bring them to Syria via Turkey and who was in contact with the girls online, according to Sky News. At least 22 young women are believed to have traveled to Syria from the UK within the last year.